Back on April 3rd, T-Mobile halted the rollout of Android 8.0 Oreo to its version of the Samsung Galaxy Note 8. The carrier had started pushing out the update on April 1st before it was forced to stop for an undisclosed reason. 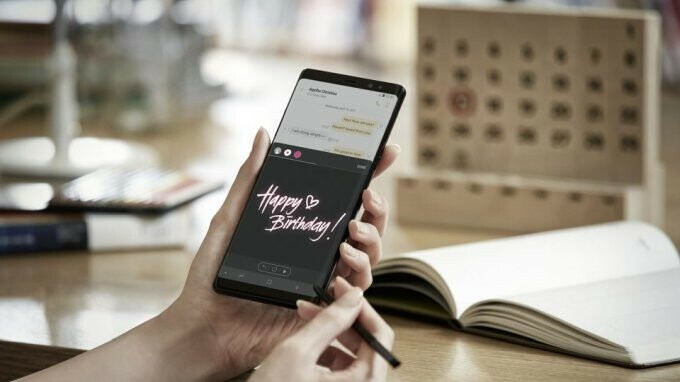 Well, if you happen to be a T-Mobile subscriber sporting the Galaxy Note 8, we have some great news. Starting tomorrow, Sunday May 13th (which is also Mother's Day), T-Mobile will resume sending out the Android 8.0 update starting at 10pm PDT (which is actually 1am Monday morning in the East). The new version number is N950USQU3CRD7 and includes bug fixes and performance enhancements. New features found in Android 8.0 include picture-in-picture, which allows users to watch video on the screen while interacting with another app in the background. The update also includes new emoji, notification channels and the ability to snooze those notifications that aren't about pressing matters. And don't forget the redesigned settings menu, which has been trimmed down. When you receive the notification that Android 8.0 is ready to be installed on your T-Mobile Galaxy Note 8, there are two things that you should do prior to starting the updating process. Make sure that you are connected to a Wi-Fi signal, and recharge your battery to 100%. Since this update is being sent out OTA, it might be a few days before it hits your phone. If impatient, you can try to grab the update manually by going to Settings > Software update > Download updates. T-Mobile also says that to avoid network congestion, a limited number of updates are available daily. If the limit has been reached on a specific day, try again the next day. You surely didn’t read “T-Mobile”. This has nothing to do with Android and everything to do with T-mobile, aka. the American providers, who completely control how fast and when updates get out in the US. These updates has already made it to the unlocked versions a long time ago. Was one of those unlucky souls to get it right away. This thing was super buggy. Basically the water detection software goes nuts when a SMIDGE of moisture is detected. It freezes, then reboots your phone... TWICE before going away. Basically, if your hands aren't bone dry, and you're holding you hands in landscape mode (or portrait, but landscape seems to happen more since you tend to cup your phone), that's when the evilness begins. There were some other bugs, like the emoji's not appearing in Messages right away, but after a few tries, and other things. Hopefully people like me can get the new version as well. We'll see. I got it right away. Works fine.